Thought you might like to see some of my efforts. 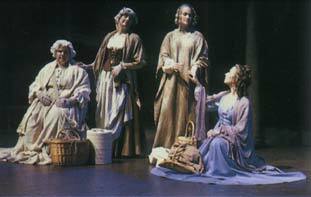 In 1994 our community theatre company put on Ed Graczyk's 'Come Back to the 5 and Dime, Jimmy Dean, Jimmy Dean'. It is the story of James Dean fans who gather in a tiny Texas town to remember the actor on the anniversary of his death. 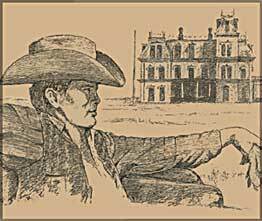 This is my pencil drawing of James Dean on the set of 'Giant' which we put on our program cover. One way to stretch my creative wings has been to take to the boards and shamelessly hog the spotlight. I participated in the Wisconsin Shakespeare Festival a couple times. Here I'm portraying Mariana, looking on as friends discuss troubles in William Shakespeare's 'All's Well That Ends Well'. This photograph was taken by our costume designer Wendy Collins. While I don't own one, anyone who knows me knows I love horses. 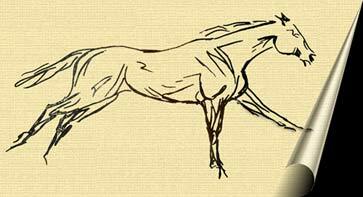 When I was young, I drew horses so that I could point to something and say "That's my horse!". 'Running off' is a more recent drawing. Despite the fact my favorite medium is detailed pencil, this was sketched quickly with a felt tip pen. I added a bit of texture and shadows in Photoshop, and the page curl effect is courtesy of Doctor Franklin software. I was trying to convey the notion that this fellow was about to run right off the page. Here's a different photograph of me onstage. This is a scene from one of my largest roles. I played the Mother Superior in John Pielmeier's 'Agnes of God', the story of an abused, mystical novice accused of murdering her newborn. Or was the child murdered by someone at the convent trying to cover up a scandal? Photo by Bryan Ragon. 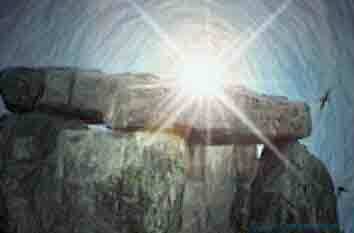 This is 'Stonehenge Solstice', which started life as part of my rather mundane videotape of Stonehenge. My friend Cindy and I were there for all of twenty minutes one overcast March mid-morning on a tour. Naturally, we didn't have the wherewithal to wait for a dramatic and mysterious picture of the stones, so I created one. This was done with a plethora of filters in Adobe Photoshop, Microsoft Image Composer and MetaCreations Painter Classic. Another one of my many horse drawings. This is based on a popular weathervane pattern, 'Dexter'. 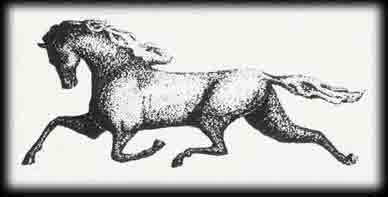 The origin of the prototype was a popular harness racehorse of the late 1890s. President Grant enjoyed driving him down Pennsylvania Avenue, courtesy of Dexter's proud owner. I stylized the pattern greatly, elongating the figure, arching the neck and making his head smaller. You've probably guessed it by now, but I enjoy taking photographs. I also enjoy manipulating them. 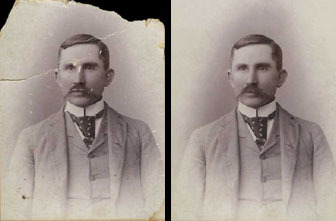 For instance, the picture on the left is a picture of my maternal great-grandfather. As you can see, the original on the far left is badly damaged, with spots, chips and tears. Using Photoshop, I was able to reconstruct the picture so it doesn't look quite so ragged. Most people probably don't view "organizing" as a creative exercise. I do. It takes a certain creative ability to look at a space and see the possibilities to make it function better. At work we use to store extra issues of our publications in boxes under a counter. It was hard to locate anything you wanted quickly. After I'd finished organizing it, publications were in filing drawers with labels on the front to identify the type stored in each drawer. Much better! Copyright © 2002-2006 Celestial Realm. All rights reserved.